With Oscar season in full swing, if you’re like me, you’ve probably read articles, seen and discussed just about every movie that’s been snubbed and nominated. But I’m going to take a step back from the award chaos to talk about a Netflix film I haven’t stopped thinking about since I watched it. I’d rather not say how many times I’ve watched A Futile and Stupid Gesture in the past week because it’s embarrassing and brings to question whether I work or do anything else with my life. What I will say is that I need more than one hand to count it on. 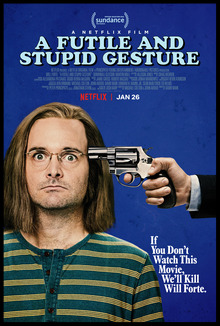 A Futile and Stupid Gesture is biopic about Doug Kenney, one of the founders of National Lampoon magazine and the writer of Animal House and Caddyshack. Before I get into the beauty of this movie, I’d like to note that I’m not a huge Doug Kenney fan nor did I know anything about him or his life before watching this movie. I cannot speak to how well they paid homage to him, but I appreciated every second of the story, learning as I went along. I found it to be smart, funny, original and, most importantly, entertaining. Even though it's based off a true story, a lot of other people probably don't know about Doug Kenney either. So I will make a quick SPOILERS AHEAD note before I continue. I've been blamed and criticized enough for spoiling movies, I won't do it on my first column about one. Now that we've settled that, the story opens with a modern-day Doug Kenney (played by Martin Mull) being interviewed. For fellow Kenney newbies, this narrative device just seems like Mull is the real, older Kenney introducing us to his life story. After a quick Wikipedia search though you discover that Doug Kenney died at 33. This bold choice sets the tone for the rest of the film’s wacky style and unconventional character choices, including casting 47-year-old Will Forte to play Doug from the age of 18-33. They actually didn’t cast anyone who looked similar to the real people portrayed in the movie. Joel McHale plays a young Chevy Chase and Jon Daly, Bill Murray. Not only did the actors not look like their characters, but they didn’t really act like them either. Instead of doing full-on impressions, the actors just captured the overall nature of these iconic comedians. It may sound like a recipe for disaster, but I found it to be quite refreshing. There’s so many movies these days based off real people that we get enough impersonations. In this year’s Oscar season alone we have Tonya Harding, Tommy Wiseau and Winston Churchill. In A Stupid Gesture you just accept the characters for who you’re told they are and move on from there. Because it's just not the point. This funky narrative style perfectly coincides with the colorful bright backdrop of their 1970’s New York and LA. The setting's bold colors are beautiful yet simple enough so not to distract from the jokes being told. As they point out in the film, this is perfectly in line with the art of National Lampoon magazine. As for the jokes and writing, I found the back and forth, punchy dialogue between Doug and his National Lampoon business partner, Henry Beard, incredibly fun to listen to. Kenney’s quick-wit and over-the-top bits were enjoyable from start to finish. Even during his downfall, Kenney still maintains– a sometimes dark– humor that comes so to naturally him. There's one scene that just about sums up Kenney's brilliance and the toll it took on him. Towards the end of his life, Kenney and Beard meet up in New York during a Caddyshack press event. Kenney is drunk and depressed that the movie is a failure. Beard reassures him, saying, "You wrote the most successful comedy of all time on your first try." Kenney replies, "that was two years ago." This small interaction is all you really need to understand Kenney's inner demons. Throughout his hugely successful career, instead of enjoying it, you see him trying to find the next bigger thing. As a way to cope with the pressures he puts on himself, his partying goes from a fun pass time to a destructive distraction (like drinking a bottle of whiskey before a big press event). At the end of the scene, as he stumbles to the door, Beard asks him if he needs them to call him a cab. "I'm a cab," he slurs back, in true Kenney fashion. All of these components combined have me completely infatuated. The beautiful esthetic draws me in while the quick dialogue and goofy style keep me invested. It’s almost like this film has some sort of hypnotic power over me that I don’t quite understand. I highly recommend you watch it anyway, but if you do, maybe you can help me figure it out. In the meantime, I'll just be over hear racking up more views and loving every second of it.